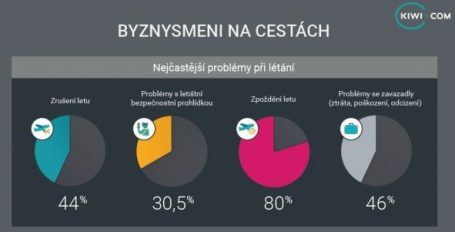 Kiwi.com, one of the world’s leading online travel agencies, found that 44% of Czech business travellers surveyed had suffered from their flight being cancelled, with 4% complaining that they had received no compensation from the airline. Kiwi.com’s survey of 315 respondents*, who fly abroad for a business trip at least once a year, also revealed that flight delays remain endemic in the industry, with 80% experiencing their flight being delayed and 33% of those receiving no compensation from the airline for the inconvenience caused. Kiwi.com covers all trip itineraries with its so-called Kiwi.com Guarantee, which protects travellers who book through the site in the event of delay, cancellation or schedule changes. It means that if a passenger’s first flight is delayed and the connecting flight with the other airline is missed, the company will book another flight to the final destination free of charge or refund the money, all through their 24/7 customer service. Other problems that business travellers encountered were to do with airport security (30.5%) and their baggage (46%). Interestingly, more women (52%) reported baggage problems than men (42%), while more men (33%) experienced problems with airport security than women (26%). Guarantees for flight delays and cancellations were picked by 23% of respondents as one of the key qualities that they look for in an online travel agency. Unsurprisingly, the best price (45%) was by picked by most respondents as the key quality for an online travel agency. At the heart of Kiwi.com’s business is its proprietary algorithm, which allows users to automatically combine flights from more than 650 airlines, many of them budget carriers that do not normally collaborate with each other, into a single itinerary in a process it calls “Virtual Interlining”. This throws up significant savings: the German magazine Focus found Kiwi.com to be, on average, 28% cheaper than the competition, and in some cases the savings were as high as 90%. A demonstration of its so called MultiCity flight search engine came up with an eight-city European itinerary for €161. The survey also found that the overwhelming majority (66%) of Czech business travellers book their flights themselves while 34% get their assistants to do it. In terms of transport to/from the airport, most (44%) take public transport, followed by private limousine provided by the airline (22%), with women (25%) more likely to use the limousine service than men (19%). Looking at the age breakdown, travellers aged 18-26 (29%) are more likely to use the private limousine service provided by the airline, while those aged 27-35 (50%) are more likely to use public transport, and those aged 45-53 (20%) picked a rental car as the most frequent option. * Data collection was implemented through Ipsos Instant Research on behalf of Kiwi.com.